Sunderland Strollers to host new event The Urban Ultra. Sunderland Strollers’ ultra distance runners will be able to compete in their own event when the club hosts the Urban Ultra in November. 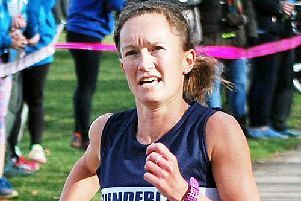 The Ashbrooke club has a growing band of ultra distance runners and a race on their doorstep is sure to be popular. In early July, Over-50 Stroller Stuart Percival set a then record for the Abraham’s Tea Round, 30 miles run starting in Keswick at the Abraham’s tea rooms. He covered the distance with 3,475 feet of ascent in 10hr.05.47. He was back again to the Lakes for the gruelling Montane 100 Tour of the Lake District with six other Strollers. Percival covered the distance in 29hr.18.00 to finish 47th and Louise Otterson was the first Strollers woman in 37hr.05.59. The Lakeland 100 is a circular route encompassing the whole of the Lakeland fells and includes 6,300m of ascent, consisting of almost entirely of public bridleways and footpaths. The route starts in Coniston and heads to Dunnerdale Fells, Eskdale, Wasdale and Buttermere before arriving in Keswick. The route then heads to Matterdale and continues to Haweswater before returning via Kentmere, Ambleside and Elterwater to the finish at Coniston. A big turnout of Strollers arrived at Dalemain for the 50 mile which is half the 100 route. Despite hail stones they battled on and many got the 100 qualifying time. First Stroller was Luke Kennedy in 22nd in 9hr.27.32 with Ashleigh Bennett ninth woman in 10hr.26.06. The Strollers also supplied many marshals for the event, having to look after 100 runners and spending Friday and into the early hours in a barn at Wasdale. There volunteering was recognised by the organisers as they received a charitable donation to the Sunderland Sports Board. Now the Strollers can look forward to their own ultra which will be either a 37 or 40 mile event or a two-person relay, which will start and finish at the Ashbrooke Sports Club on Saturday, November 3. This is a new route which covers a mixture of paths, roads, tracks, streams and other byways mainly to the North of the area. There are five checkpoints at roughly equal distances of six miles apart where competitors can take onboard refreshments. Competitors are provided with a full route book and they are also provided with printed maps with the route marked. The total distance to be covered by competitors can be either 37 or 40 miles, this is because of the Ultra parkrun Challenge. This point on the course is adjacent to the Start/Finish of Sunderland parkrun. After an 8am start this is 6.8 miles into the event. Competitors have the option of continuing along the route or alternatively they can take part in the parkrun and register a time. The parkrun starts at 9am. The fastest recorded parkrun by an Urban Ultra competitor who subsequently completes the full course will be awarded the Ultra parkrun Challenge Trophy. There are cut-off times along the route and these are as follows (times based on 8am start): Silksworth Sports Complex – 6.8 miles –1 hr 55min. (9:55am), Fatfield – 12.8/15.8 miles – 4hrs 20min (12:20pm), Hylton Castle –19.1/22.1 miles – 6 hrs (2pm), Wellhouse Farm – 25.8/28.8 miles –8 hrs (4pm), Roker Pier – 32.8/35.8 miles –10 hrs (6pm). There will be trophies for the first male and female competitors along with the first three teams in the relay. Last year’s race was won by Steve Rankin in 5hr 23min. Race entry details are on the Strollers website. The Gateshead 5K tonight (6.45pm) on the quayside at Newcastle has attracted a top class field. The men’s race includes a number of athletes that have beaten 15 minutes. Women entered are: Danielle Hodgkinson (Wallsend), Rebecca Robinson (Kendal), Lydia Turner (Birtley.